Salman's next film after HAHK did 3 times better business than Sunny Deol's very next film after Gadar. Chand Ka Tukda - 25 lakh. Chand Ka Tukda - 73 lakh. Chand Ka Tukda - 2.05cr. Chand Ka Tukda - 30.5 lakh. Kasam - Only 10 lakh (lol). According to muft ka Tauji aka Tom Cruise aka bazigarh Salman doesn't deserve credit for HAHK success bcz his next film after HAHK did not do well at box office. Now someone please ask our tauji that how much credit Sunny Deol deserves for Gadar's success after delivering 3 times worse under performer Kasam. Sunny deol never was close to Salman's stardom. The latter has sustained and built a massive box office empire which will stand the test of time. Sunny was never versatile enough to reinvent himself. And yeah gadar is the most unworthy and overrated ATBB in movie history, my personal opinion..
@Irdwhelp, knowing tauji, he will make 5 more posts to tell us about the importance of Gadar. Delayed? What about Majdhar and Andaz Apna Apna? Did you ever mention it? Salman's next had around 31 lakh ff but tukka paazi's next had only 10 lakh ff. Tukka paazi ka 10 lakh Salman ka 31 lakh se better kaise hai tauji? Bobby Deol's Gupt,Soldier and Humraaz has much more repeat value than Big Blockbusters of recent times.Very True..? 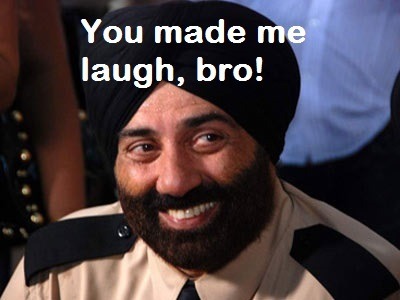 Someone told me that Dhoom 3 is better than All Sunny Deol's Films.Do U agree?